Welcome to Ablepaws Kennels. 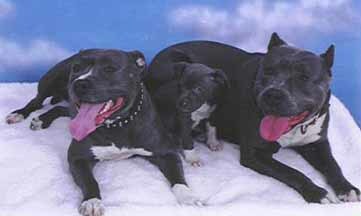 We specialize in well tempered, sound, quality Pit Bulls - all with large heads and stocky bodies. Puppies available year round in all colors! (Except for solid white) Our puppies are home raised with our four children, our family cat, and other animals. Pups are shipped with a full health certificate, vaccines, worming, dewclaw clipping (at request), and ears cropped (by request, with a small additional fee). Please e-mail for pictures & pedigrees that you do not see on our site. We have some AWESOME BLUE pups, of course all pups are awesome, but if you like BLUE then you have reached the right place. Our rare secondary color is a beautiful CHAMPAGNE. Champagne is a unique color that is attractive, and absolutely striking in appearance. When all of our puppies leave, they are ready to go to homes for show, protection, agility, obedience, or just to sleep on your couch. You'll love our beautiful babies! 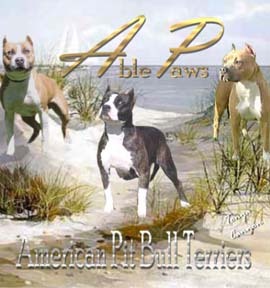 As much as we like to see them achieve titles and go onto be among the Greats, we love (even more) to see them Happy and Loved by people who will understand them, and show the public what a versatile and wonderful dog the American Pit Bull Terrier is. It is hard to choose what pups to show the public because they are so perfect, and are all loved for their qualities. However, pictured throughout this website are just a few of our wonderful babies. If you are truly looking for perfection or you just want to chat about our wonderful breed, give us a ring or send an Email. We here at ABLEPAWS are always willing to talk and educate! Thank you for stopping by our website. Below is our contact information. Hope you enjoyed the site, we are waiting to hear from you! Copyright 2003 • No copying images without permission!